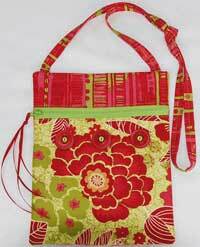 Runaround Bag - Retail $10.00 [LGD111] : Wholesale Purse Patterns, Purse Patterns at wholesale prices for quilting shops, craft stores, and fabric shops. The Runaround bag pattern is a great little purse to carry you through your busy day with a back pocket and a zip closure. Finished size is 7" x 9" and fat quarters work great with this pattern.